Much ado has already been made about the re-recorded dialogue that is to be used in the Silent Hill HD Collection. Critics like myself have already been accused of being “haters” and "unwilling to accept change". Fortunately (or is it unfortunately? 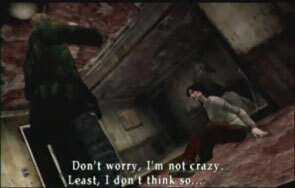 ), Konami has given "haters" like me plenty of reason to hate the Silent Hill HD Collection. Avoid the Silent Hill HD Collection at all costs! I have extra copies of the original games. If you want to play them (and you know me personally), you can borrow them!